Before looking at Epitrochoids, consider the three kinds of cycloids. A cycloid is the locus of a point attached to a circle rolling along a line.If the point is on the circle a cycloid is generated. Cycloid – A point on a circle rolling on a line. If the point is in the interior of the circle a curtate cycloid is generated. 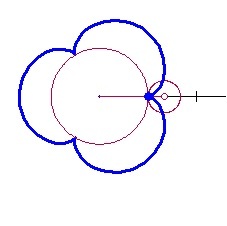 Curtate Cycloid. A point in the interior of a circle rolling on a line. If the point is in the exterior of the circle a prolate cycloid is generated. Prolate Cycloid. A point attached outside a circle (such as on the flange of a train wheel) rolling on a line. Using our Roulette Generator we can produce similar curves called epitrochoids the locus of a point attached to one circle as it rolls around another circle. If the point is on the moving circle an epicycloid is generated. These were discussed in the preceding post. R is the radius of the moving circle and S is the distance of the point whose locus is graphed from the center of the moving circle. By changing the position of the point relative to the center (where S = 0) we can see a similarity with the cycloids. R = 0.4 and S = 0.25. A close inspection will show that this curve is similar to the curtate cycloid wrapped around a circle. The next obvious question is what happens if S > R? Then the resulting curves have inner loops similar to those of the prolate cycloid. Finally, we can see the range of curves by changing the values of S. The next video shows the progression of shapes as S changes from 4 to -4 . Watch the orange point. S is the distance between the orange point and the center of the smaller moving circle(open point). The negative values amount to starting the moving circle on the opposite side of the fixed circle and gives the same curves in a different orientation. Investigation 5: What is the shape of the curve when S = 0? Investigation 6: What shape does the curve approach as S approaches infinity? Next post: hypocycloid – for those who like to be negative.